EA has now opened the doors on its new Battlefield 3 website and has announced that their new game will be arriving in the Autumn of 2011 probably on the PlayStation 3, Xbox 360 and PC. 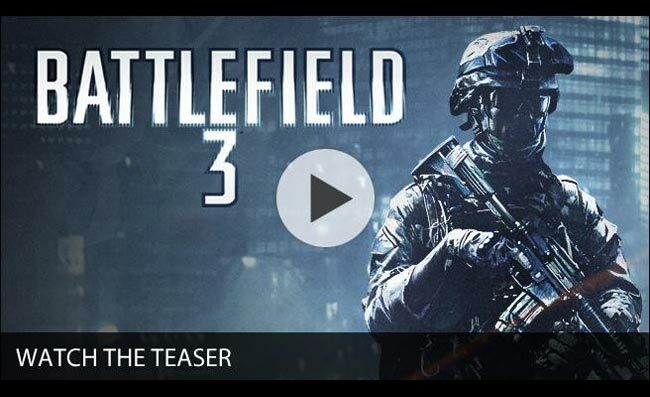 Battlefield 3 will be powered by a Frostbite 2, the next generation of DICE’s cutting-edge gaming engine and brings a new destructive gaming style to the first person shooter. Using a new animation system that originated from EA Sports, and environments that are more destructible than ever before. Watch the 40 second teaser trailer after the jump. Battlefield 3 delivers spectacular visuals, earth-shattering destruction and real as hell combat gameplay providing a dramatic immersive First Person Shooter experience. One moment you may be marching down a hilltop listening to the hypnotic sound of a firefight in the distance or admiring the way the light reflects off the smoke plumes of ground to air missiles rising from the city you’re about to engage. The next you’re on an urban street, surrounded, claustrophobic, fighting for your life and looking eight ways at once with all your senses on high alert, chilled at the knowledge that the building you’re hiding behind can be your best friend or your worst enemy. Welcome to Battlefield 3.